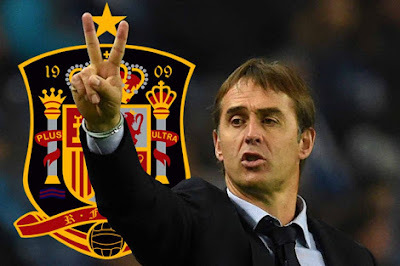 After guiding Spain easily through qualification to the World Cup finals, Lopetegui had agreed on a new contract up until Euro 2022 just last May and was not among the more than 20 names which had been linked with the Bernabeu vacancy in the local media over the past two weeks. His only other top-flight club experience came in 18 up-and-down months at Porto, where he failed to win a trophy but reached the Champions League quarterfinals. He then succeeded mentor Vicente Del Bosque in the Spain job following La Roja's early exit at Euro 2016. Lopetegui impressed in quickly blending together a new side which won nine of their 10 World Cup qualifiers and is among the favourites for this summer's finals in Russia. Spain will face Iran and Morocco in Group B after the challenge of Cristiano Ronaldo's Portugal in their opener on Friday.